WHAT ARE THE GREAT ONES DOING? A Brackin Elite Swim Training blog from the 2015 Swimming World Championships meant to inspire and teach athletes and coaches from the experiences of the great ones! Today I met Alzain Salem, whom I’m guessing is the youngest swimmer competing at 2015 World Championships. Alzain represents Bahrain and is 10 years old. Yes, TEN! She is competing in the 50 fly and 50 free. At this meet, she has a goal of going 34-POINT-ANYTHING in the 50 free. When I asked Alzain what swimmers were her role models; she said she didn't really have any particular swimmer but, "the fliers inspire" her. She admits her start is much better than her finish because she gets “soooo tired!” After she finishes racing, she remembers to eat right away which generally is some fruit along with lots of water. I asked Alzain what she does to calm her nerves, as she acknowledged she is a bit nervous for this meet. She gave a great answer; “I try to forget about everything! I will talk to my teammates about anything but swimming!” At the ripe age of ten, she has already learned what works for her – not over thinking, using a bit of distraction and staying loose. This is her first international meet where she will represent Bahrain. Her smile made it clear how proud she is to represent her country. Of course her family is also super proud. Her father is here to cheer her on, and is an administrator for the Bahrain National Team, but mom and sister are at home. 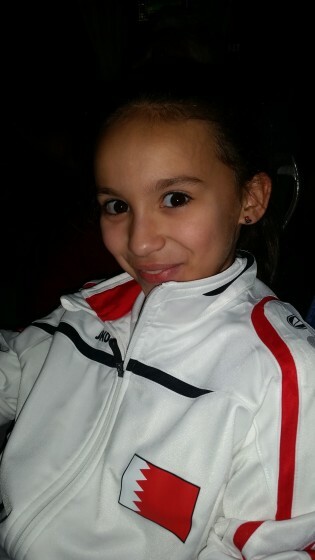 Her younger sister is also a swimmer, but Alzain says she will not be faster than her when she is ten! When Alzain isn’t training or competing she likes to play in their backyard pool with her sister. She of course has some long-term goals; in the future, Alzain said she would like to work in an airport because she loves to travel. In the short-term, Alzain aspires to compete for Bahrain in the 2016 Olympics. In order to qualify for FINA competitions she must be one of the two fastest females in her country. In an effort to create “universality” (allow for worldwide representation), regardless of whether the A or B time standard has been met, FINA will invite the top two athletes from every country and allow them to swim two individual events*. I of course assumed there was a minimum age but there isn’t! Part of me is very excited for Alzain; she has the opportunity to travel the world, learn by watching athletes compete at the highest levels, warm up and cool down right next to them. But, another part of me also wonders, is this too early? Is there undue pressure on her to represent not only herself, her family and home team BEST (Bahrain Elite Swim Team), but her NATION? Will she be overwhelmed, rather than inspired, by the competition in Kazan? Instead, should she be giggling with her ten year old peers at a crowded age group meet, with no warm down pool, competing to win? I’m not completely sure but, if this high level of competition is handled age appropriately by her coaches and family, it can be a great motivator for her, help her develop positive character traits such as sportsmanship, humility, work ethic and perseverance and, help her to improve the quality of her performance in her racing and training. I suppose time will tell but, for now, Alzain seems to be a very confident, well-spoken and eager competitor – all 4 ft of her! I will be cheering loudly for her! - With three (3) swimmers who have achieved the “A” or “B” Standard Entry Time, one (1) additional swimmer provided that both genders are represented. - The swimmers who have not achieved either Standard Entry Time will only be permitted to enter up to two (2) individual events each”.